Well you've probably already heard this news if you follow me on Facebook or Instagram, but we are excited to announce that we are expecting baby number two in the new year. I'm actually 13 weeks, this photo was taken last week. I used the A Beautiful Mess app to add the text overlay (they have a fantastic pregnancy/first year bundle as an extra that you can purchase). I did weekly photos with Miss M but was in my pjs for all of them, so wasn't quite comfortable to share them with the world. This time around though I'll be sure I look presentable! This time I grew a lot quicker and popped out almost straight away. I think I was only at 8 weeks when already my jeans didn't fit and I was trying to wear baggy cardigans to cover up until the news went public. I've been so fortunate with both pregnancies that I haven't had any morning sickness, just that good old first trimester fatigue where you're sitting on the couch at 8pm and you can barely keep your eyes open. So grateful Miss M is a good sleeper! She's very exciting about mummy having a baby. For quite a while there she thought that everyone with a bit of a 'belly' had a baby in there, so I'm just trying to delicately explain that one to her. She's convinced that it will be a girl (because mummy is a girl she says, and daddy can have the boy baby). At the moment she's getting right into role play with her teddies and dollies, dressing them up so they're warm, changing their nappies, putting them to bed and rocking them to sleep. It really is lovely, and I think she'll be a good big sister. She'll be nearly 3 when baby number two arrives. We found out Miss M was a girl at 20 weeks and we will do again this time around. I'm looking forward to sorting out all her baby clothes either to use again or donate. I can't wait to set up another nursery (and I'll be sure to share in here on the blog). Miss M has decided that she'd like to keep her bedroom. Over the past few months I've come across some fantastic pregnancy and parenting articles, but couldn't share them until now as I didn't want to give anything away! Sarah from Working Mums Collective wrote a touching and honest article about when a family changes from one child to two. Definitely worth a read if you like me are pregnant with your second. Click here. Liv (another Adeladian blogger I've recently discovered) from Eenie Meenie Miney Mum wrote about why she didn't find out the gender of her babies. She (like me) sounds like a super organised type, so I found it really interesting to read her point of view. Jess from The New Mum Blog is also pregnant with her second and wrote about how her first pregnancy is different to her second. I am living this reality right now! It is so different when you have a toddler to look after as well as looking after yourself. 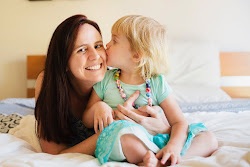 Lauren from Canberra Mummy is another fellow blogger pregnant with her second, and has a fantastic ebook 'OMG I'm Pregnant! Now What?' which I would highly recommend to first time mums. Wholesome Mummy Life wrote a great post about why it's easier (or in some cases harder) to have two children compared to one. A great read to prepare me for what's to come. I can't help myself but start thinking about baby names - The Huffinton Post recently shared the top baby names for 2015. And finally, I had a good laugh while scrolling through this one on Buzzfeed. 23 things no one tells you about having a second kid. So please follow along with my pregnancy journey as baby grows from a lime to a lemon to an apple to an avocado etc... It's exciting to be sharing it on the blog this time around. I'll be sure to share the gender in a fun way and give you a glimpse into the new nursery. Thank you all for your kind words of congratulations over on FB and insta. Congratulations! Hope you have a smooth and enjoyable pregnancy! Thank you very much Melinda. So far so good! So excited to follow your journey!! Congratulations!! Thank you so much Damjana, and congratulations to you as well! Thanks Sarah! I found your article so insightful and honest. I think the more prepared (and pre-warned) I am, the better. It will certainly be a big change for our family to go from 3 to 4. SO excited for you and looking forward to following your journey!